1 : start by adding some smoothing cream to prevent frizz. 2 : set the hair in velcro rollers for volume. 3 : pin the curl to the bottom half. 4 : after 20 minutes, finger comb through the hair. 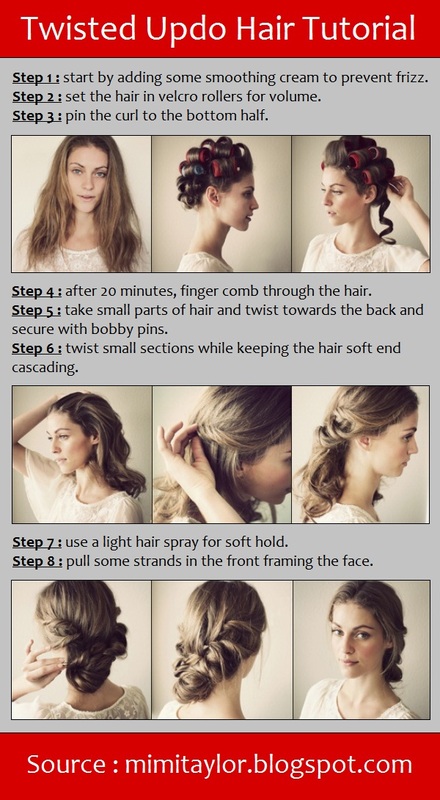 5 : take small parts of hair and twist towards the back and secure with bobby pins. 6 : twist small sections while keeping the hair soft end cascading. 7 : use a light hair spray for soft hold. 8 : pull some strands in the front framing the face.